Roberto Matta was born on November 11, 1911 in Santiago, Chile. He was educated in his native country as an architect and interior designer at the Sacré Coeur Jesuit College and at the Catholic University of Santiago, from 1929-31. In 1933 he became a Merchant Marine which enabled him to leave Santiago and travel to Europe. From 1933-34 he worked in Paris as an atelier for famed-architect Lecorbusier. Towards the end of 1934 Matta visited Spain, where he met the poet and playwright Federico García Lorca, who through a letter, introduced young Roberto to Salvador Dalí. Dali encouraged Matta to show some of his drawings to Andre Breton. Matta’s acquaintance with Dali and Breton strongly influenced his artistic formation and subsequently connected him to the Surrealist movement, which he officially joined in 1937. He was in London for a short period in 1936 and worked with Walter Gropius and László Moholy-Nagy. Matta’s employment with the architects of the Spanish Republican pavilion at the Paris International Exhibition (1937) exposed him to Picasso’s Guernica (1937; Madrid, Prado) which greatly impressed him and influenced him in his work. At this time, he was introduced to the work of Marcel Duchamp, whom he met soon after. He later went to Scandinavia where he met the architect Alvar Aalto and then to Russia where he worked on housing design projects. The summer of 1938 marks the evolution of Matta’s work from drawing to painting. Roberto completed his first inscape oil paintings while in Brittany and working with Gordon Onslow Ford in Brittany. Forced to leave Europe with the outbreak of war, Roberto arrived in New York in 1938. Roberto Matta first exhibited in the Julian Levy Gallery, New York in 1940. 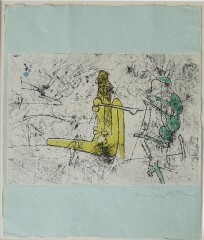 In 1947, Matta was expelled from the surrealists. By 1950’s and 60’s he established homes in Rome, Paris, and London. Roberto visited Cuba in 1960’s to work with art students. In 1962 he was awarded the Marzotto Prize for La Question Djamilla, inspired by the Spanish Civil War. His work of the 1960’s tended to have distinct political and spiritual intentions. Much of his work consisted themes related to events occurring such places as Vietnam, Santo Domingo, and Alabama. An exhibition of 1968 at the Iolas Gallery in New York displayed much of this work. The 1960’s marked not only a change in his themes, but in his style. He found influence in contemporary culture while remaining close to his Surrealist roots. His work can generally be split into two areas: cosmic and apocalyptic paintings. Matta used automatism in a manner that allowed one form to give rise to another until unification was achieved or until further elaboration destroyed the composition. These “chance” compositions are exploited with a fully conscious purpose.